We have a school garden and the Water Explorers have been inside the polytunnel to plant lettuce seeds. We prepared the compost with a shallow hole, placed a couple of seeds in and then watered them well. We kept them warm inside the polytunnel. When they were bigger we carefully transferred the seedlings to the raised beds and we will keep looking after them until they are ready to eat. We will then harvest them and give them to the school cook to use in a yummy salad for lunch. 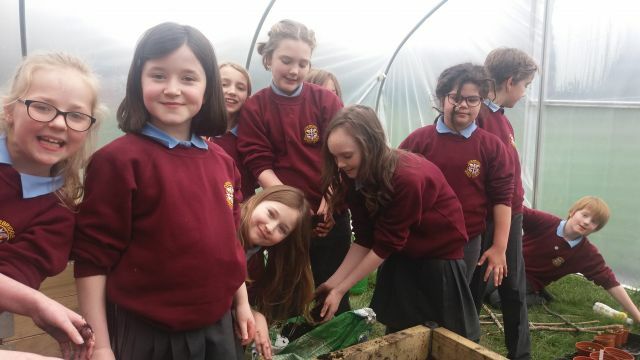 We also went outside in the spring sunshine sowing flower seeds to attract bees – we need bees to pollinate some of the fruits and vegetables we grow in the garden. We also combined regular garden activities with a task from Practical Action on Floating Gardens. In Bangladesh and other countries which regularly get floods they have a problem when their crops get damaged. We challenged the water explorers to develop floating gardens which could move up and down with rising or falling water levels. We built rafts of willow, tied floats of re-used bottles, added compost and planted some lettuce seeds on the rafts. Then we tested them to see if they would float. All three rafts successfully stayed above the water!